This year’s newcomers include established names in the fleet industry such as leading fleet services provider, Kwik-Fit Fleet, and Activa Contracts, a subsidiary of Arnold Clark Automobiles. 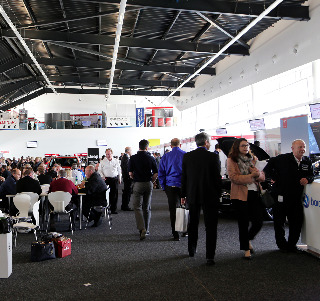 They will be joining the dozens of vehicle manufacturers, leasing companies and other fleet suppliers that have already confirmed their places at one of the UK’s largest fleet events, which again promises to provide something for everyone. Last year’s Fleet Show attracted higher numbers of top quality fleet decision-makers than ever before – up 25% on the previous year – and the audience has increased in size every year since the inaugural event in 2011. This year, the audience will be audited by the Audit Bureau of Circulation (ABC) for the first time to give a clear and auditable record of the number of fleet decision-makers attending the event. As regular visitors have come to expect, the 2016 Fleet Show will include a huge array of interesting features for fleet decision-makers that will more than justify taking a day out of the office. There will be test driving of more new cars on three circuits – the National, International and Stowe circuits – plus a road route, with an emphasis on some of the very latest alternatively-fuelled models, as well as more conventionally-powered vehicles. The organisers are expecting test drives to again be very busy this year after driving at last year’s Show increased by 20%. And, as well as test driving the newest models, the 2016 Show will again feature anindoor exhibition in halls 1-3 of the state-of-the-art Silverstone Wing, with a wide array of exhibitors demonstrating some of the latest developments, products and services in the fleet arena. This will provide Show visitors with the chance to hold face-to-face meetings and network with exhibitors and other visitors alike. From an education point of view, there will again be series of informative and thought-provoking fleet management workshops, which will be run by actively serving fleet managers. Back by popular demand, the new-style, interactive workshop sessions will again have the intention of stimulating discussion and audience participation, as well as tackling some of the leading fleet topics of the day. Last year’s record-breaking event was described by many exhibitors as the “most successful Fleet Show ever” and it is the clear intention of the organisers to build on that success still further. Fleet Show director Jerry Ramsdale (pictured) commented: “We had a fantastic Fleet Show at Silverstone last year – and our aim is to deliver an even better Show on 11 May. “We are already well on the way to doing just that, with a host of newcomers already signed up for this year’s Show, while the overwhelming majority of last year’s exhibitors have confirmed they will again be at Silverstone this year. “We were delighted with the quality of the audience last year, with many fleet decision-makers realising that the Show offered the perfect balance between test driving, networking and education.